Otra vez nos juntamos en la Plaza San Martín, Barrio de Retiro, Cuidad Autónoma de Buenos Aires (Frente a las oficinas de Monsanto), como fue el 17/9. DECIMOS SI A LA VIDA!!! WASHINGTON, ME – November 23, 2012 – On November 21, 2012, the Court of Appeals for the Federal Circuit in Washington, D.C., announced that it would hear the Appeal of Dismissal in Organic Seed Growers and Trade Association et al v. Monsanto at 10am on Thursday, January 10, 2013. The landmark organic community lawsuit was originally filed in Federal District Court, Southern District of New York, in March 2011. Plaintiffs are being represented in the case by lawyers from the Public Patent Foundation, who are providing their legal services to the farmers pro bono. Plaintiff lawyer Dan Ravicher asked Monsanto for a binding legal covenant guaranteeing family farmers that they would not be pursued for patent infringement should they become contaminated by Monsanto seed. Monsanto refused to provide this assurance to the farmers. The farmers’ Appeal brief, filed last summer, cites legal and factual errors by Federal District Court Judge Naomi Buchwald which in toto caused her to erroneously conclude that the farmers lacked standing under the Declaratory Judgment Act to seek court protection. In addition, two powerful Amicii briefs were filed in support of the farmers’ position – one by a group of eleven law professors and another by a group of fourteen non-profit agricultural and consumer organizations. These briefs will be studied by the three judge Appellate panel during their deliberations. OSGATA has re-established its Farmer Travel Fund in order to raise funds to enable family farmers to travel to the Oral Argument in January. The Farmer Travel Fund is in immediate need of contributions to support this convergence of farmers from across the United States in solidarity for the OSGATA et al. 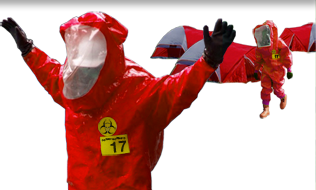 v. Monsanto lawsuit effort. Plaintiffs believe it is critical that the courtroom for the Oral Argument of this major lawsuit be filled with concerned Plaintiff-farmers in order to visibly demonstrate that the case is not just an academic dispute of patent law. Rather it is a monumental issue affecting the rights of American family farmers, with implications of global significance. EXPRESSING the support of Council for the mandatory labeling of genetically engineered products so consumers are informed that the potential long-term risks of genetically engineered products to public health and the environment are largely unknown. Section 1. 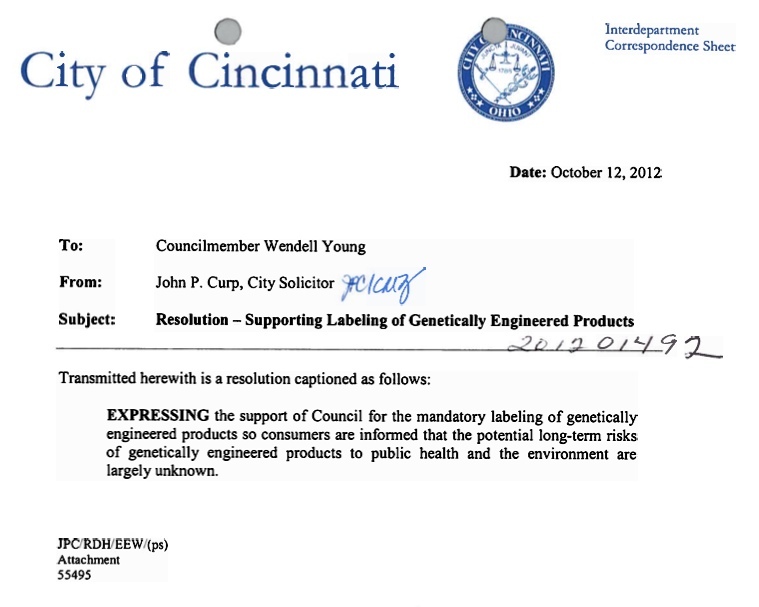 That the City of Cincinnati supports mandatory labeling of all genetically engineered products. Copy, paste, & customize the text of this resolution and sent it to your elected officials! 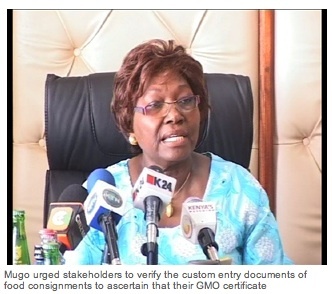 Public Health minister Beth Mugo subsequently directed all Public Health Officers at all ports of entry and all other government regulators to enforce the ban on importation of Genetically Modified Foods in the country. This she says was following the decision made by the cabinet to ban the importation of GMO foods into the country due to inadequate research done on GMOs and scientific evidence provided to prove the safety of the foods until such a time that the country will certify that they have no negative impacts on the health of consumers. She urged stakeholders to verify the custom entry documents of food consignments to ascertain that their GMO certificate. She threatened legal action against those who do not comply with the directive. It has come to our attention that Kaiser Permanente, the largest managed healthcare organization in the United States, has advised its members against GMOs (genetically modified organisms) in food. 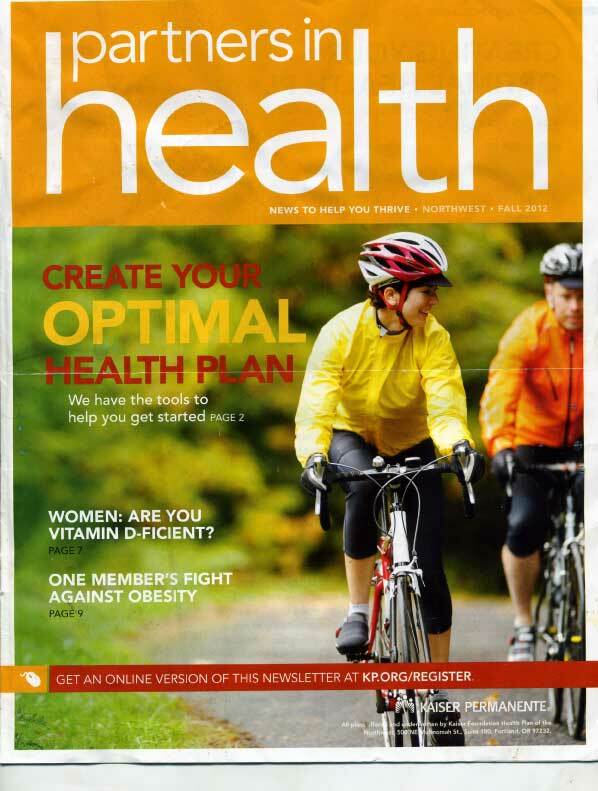 In its Northwest Fall 2012 newsletter, Kaiser suggested membership limit exposure to genetically modified organisms. 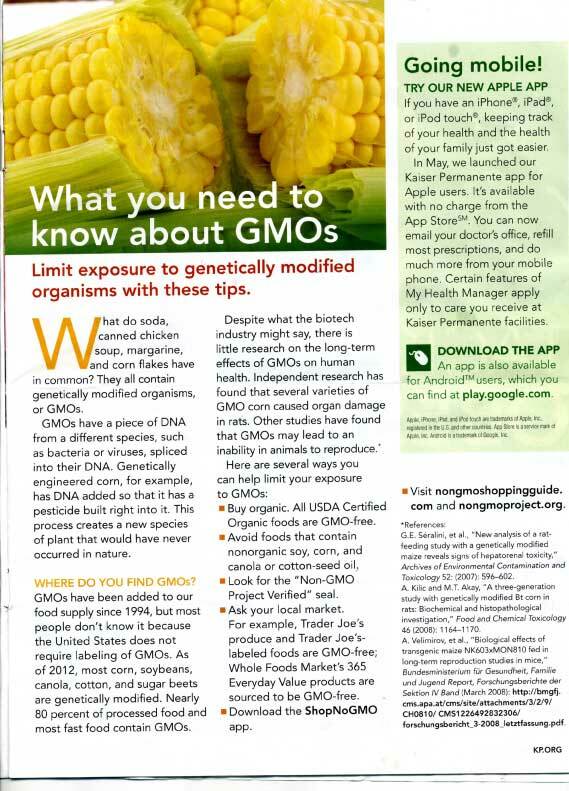 “GMOs have been added to our food supply since 1994, but most people don’t know it because the United States does not require labeling of GMOs,” according to the newsletter. Independent studies have shown GMOs to cause organ damage in rats and the inability to reproduce. Kaiser gave tips on how its members can avoid GMOs, including buying organic, looking for the “Non-GMO Project Verified” seal and to download the “ShopNoGMO” app. Since corporations are required, by definition, to augment their bottom line, we think Kaiser’s efforts to encourage GMO avoidance for the members for whose health costs they must (sometimes!) pay – is telling. What do soda, canned chicken soup, margarine, and corn flakes have in common? They all contain genetically modified organisms, or GMOs. GMOs have a piece of DNA from a difference species, such as bacteria or viruses, spliced into their DNA. Genetically engineered corn, for example, has DNA added so that it has a pesticide built right into it. This process creates a new species of plant that would have never occurred in nature. WHERE DO YOU FIND GMOs? GMOs have been added to our food supply since 1994, but most people don’t know it because the United States does not require labeling of GMOs. 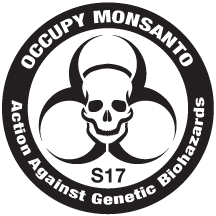 As of 2012, most corn, soybeans, canola, cotton, and sugar beets are genetically modified. Nearly 80 percent of processed food and most fast food contain GMOs. Despite what the biotech industry might say, there is little research on the long-term effects of GMOs on human health. Independent research has found several varieties of GMO corn caused organ damage in rats. Other studies have found that GMOs may lead to an inability in animals to reproduce. Buy organic. All USDA Certified Organic foods are GMO-free. Avoid foods that contain nonorganic soy, corn, and canola or cotton-seed oil. Look for the “Non-GMO Project Verified” seal. Ask your local market. For example, Trader Joe’s produce and Trader Joe’s labeled foods are GMO-free; Whole Foods Market’s 365 Everyday Value products are sourced to be GMO-free.